St Joseph of Arimathea, who buried the crucified Christ. The holy and righteous Joseph of Arimathea was a wealthy member of the Jewish Sanhedrin and a secret follower of Christ (Matt. 27:25; John 19:38). His feast day is July 31. 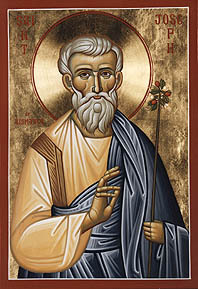 He is also commemorated on the Sunday of the Myrrhbearers—the second Sunday after Pascha. Along with St. Nicodemus, St. Joseph removed Christ's body from the Cross, prepared it for burial, and placed it in his own sepulchre. Jewish spies found out about this and told their authorities, who imprisoned St. Joseph. However, the resurrected Christ appeared to St. Joseph in prison and convinced him of his Resurrection. Some time later the Jews released St. Joseph from prison and banished him from Jerusalem. He then traveled throughout the whole world preaching the Gospel, eventually sowing the seeds of salvation in Britain, where he reposed peacefully in the Lord. But on the third day thou didst rise, O Lord, granting the world great mercy. Lewis, Rev. Lionel Smithett (M.A., Late Vicar of Glastonbury). St. Joseph of Arimathea at Glastonbury or The Apostolic Church of Britain. 7th ed. James Clarke & Co Ltd., London, 1955. (ISBN 0-7188-9165-1). Joseph of Arimathea at Wikipedia. This page was last edited on July 31, 2015, at 03:53. This page has been accessed 41,387 times.